Joint Guard is an exclusive joint care health supplement for dogs. It provides essential nutrients for healthy joints and cartilage formation. It controls normal degeneration of tissues and protects from aging inflammation and joint pain. The joint care supplement supports in healing damaged and injured joints and cartilage. It is an excellent product for growing puppies and aging dogs for their joint health. Joint Guard is a natural joint care supplement. It contains two main ingredients – Glucosamine and Chondroitin apart from other minor ingredients. The culmination of Chondroitin sulfate and Glucosamine hydrochloride work symmetrically to repair damaged cartilage tissues, restore proper functioning of aging and injured joints in dogs. Maintenance dosage of Joint Guard helps to protect joints from degenerative effects of aging and normal wear and tear. According to dog weight, quantity of Joint Guard depends. For initial treatment, administer your dog with Joint Guard for 4-6 weeks. Give Joint Guard every day with each meal. For joint repair, combine Joint Guard with other treatments as per vet’s advice. 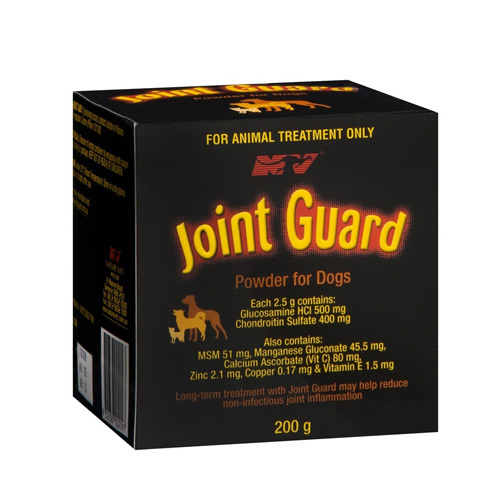 Joint Guard is a natural supplement of glucosamine that helps to maintain joint health in dogs. It provides vital nutrients necessary for joint cartilage repair and maintenance. The powder helps in substantial production of cartilage fluid and synovial joint fluid. Regular dosage of Joint Guard aids in reducing non-infectious joint inflammation. It acts as natural preventive supplement for damaged joint repair, cartilage matrix build-up and arthritis. It cures damaged joint cartilage and helps to regain normal joint health. No possible side effects seen of using this product. My 15 year old Doberman was facing problems while walking. It was later diagnosed as arthritis. One of my friends suggested me to get this product. Now my furry pal has started to show remarkable improvement. His movement has enhanced and I cannot be happier. Thank you so much!!! A great joint care product!!! My furry pal was recently operated on his rear knee. He used to limp regularly. But ever since I have applied this product on his joints the results have been amazing. I will definitely recommend other dog owners to try this product on their furry pals who are suffering from joint problems.